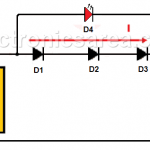 This circuit is useful to illuminate locations where a light source of low power is needed. A closet, a car trunk, are good examples. How to Make a Current Flow Indicator? 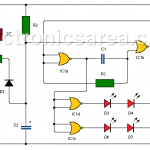 This Electric Current Flow Indicator gives a visual indication that there is a current flow. 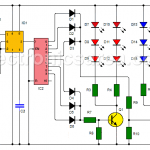 Possible applications for this small circuit may be: a battery charger, a voltage power source, etc. 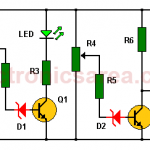 In order to achieve our objective we place 3 rectifier diodes in series, which in turn are in series with the load / battery. This simple 6-LED VU meter allows us to visualize the level of an audio signal. 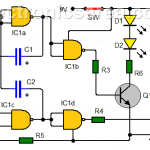 Due to its few components, it is a cheap circuit and easy to build. 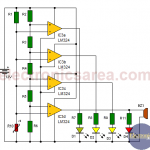 The components are very common and very easy to obtain. 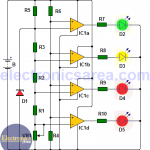 This Car battery monitor circuit is very simple and very interesting. How many times have you found that the car does not start because the battery is discharged? A green LED indicates that the temperature is OK.
Two yellow LEDs indicate that the temperature is higher than normal. This simple Car battery monitor, allow us to know the voltage of the battery at all times. 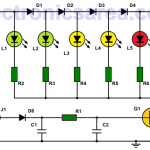 To achieve this 4 leds are placed somewhere on the dash of the car. Each LED has a label indicating the battery voltage at that time. 8 LED VU meter made of IC-LM324. 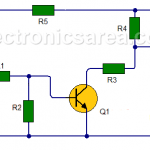 This circuit can be used to display the variation of an audio signal in a group of 8 LEDs, behaving like a VU meter. We could use an specific integrated circuit used for VU meters, but we decided to use a readily available integrated circuit: The LM324 op amp. This High – Low Temperature Indicator shows us, by means of two LEDs, when the sensed temperature is above or below a set limit. When the temperature is above the pre-set temperature level, LED D1 will light up and if it is below, LED D2 will light up.